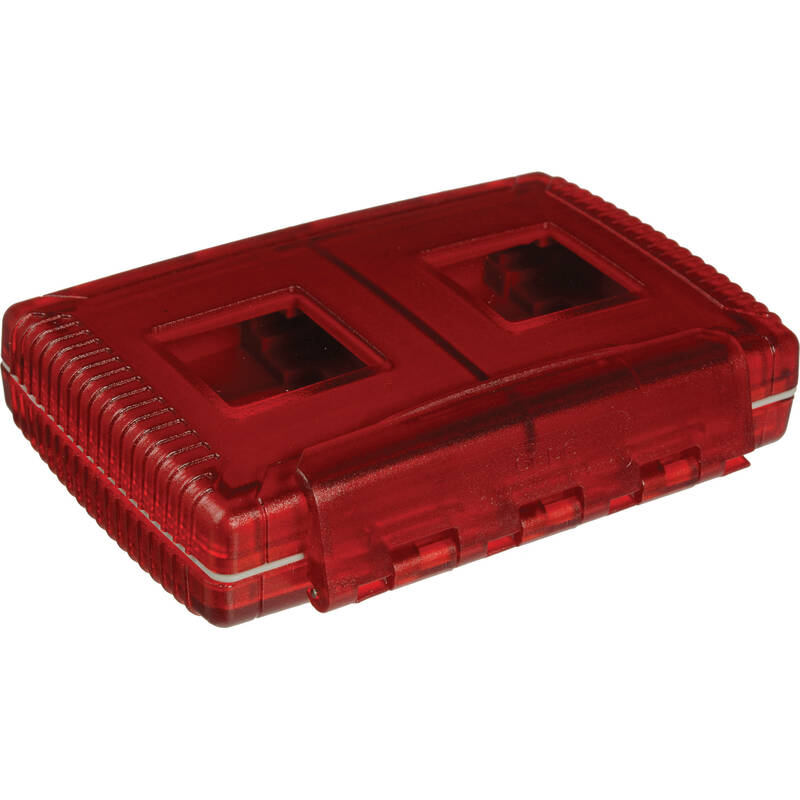 The Gepe Card Safe Extreme (Rosso Red) is a watertight case made to store memory cards such as Compact Flash, Smart Media, Memory Stick, MMC or SD cards. Inside, the memory cards are protected against humidity and dust, as well as electrostatic charge. Four compartments offer space for several different memory cards, and grip each of them tightly. The Card Safe Extreme uses insert material to protect the memory cards from being erased or damaged due to electrostatic effects. The card holder also has special viewing windows so you are able to see which space is taken by which card, even if the box is closed. This makes the organization of your cards easier. In addition, it is weatherproofed and it floats in water, and the design of the lock makes using the Card Safe a snap, even when wearing gloves. The Card Safe Extreme has been tested and certified as European IPX-7, which means it is protected against immersion in water (immersion for 30 minutes at a depth of 1 meter). Polycarbonate, anti-static inner material is used to manufacture this media case. Watertight rated as IPX-7, which means it is protected against immersion in water (immersion for 30 minutes at a depth of 1 meter). Card Safe Extreme (Red) is rated 4.7 out of 5 by 384. Rated 5 out of 5 by Anonymous from Extreme card case really is extreme... I bought the original card case awhile back, thinking that it would be a good investement for my 20gigs of memory I use for sporting events. However, after only a few months the seal became worn and didn't ACTUALLY protect my cards from moisture or weather in general. So, I sucked it up and spent $ on this case. I wish I had spent the exta couple back before I bought the 'normal' case. This case REALLY is extreme. The latch is extremely tight, and the cards fit in very, very snugly.It would be nice, perhaps, to have a card case that could hold more, but at the same time I like the fact I can stick this in almost any pocket. Rated 5 out of 5 by Trisigner from Washing Maching Proof I left this case in my lower leg pocket and sent it through the wash and spin cycle, the regular cycle, and when I pulled it our from the bottom of the washer I was very nervous... I opened it it looked and felt dry... let my cards air out over night just in case. When I went to download NO PROBLEMS still using the same cards. This case really is watertight. Awesome. Saved me several hundred $$ in memory cards. Only drawback is that the cards fit in very snug, if you are trying to change cards really quick its hard, you need two hands to get a CF Card out. Well worth the protection. Not a slim profile but I take the safe keeping every day over a slim pocket line. Rated 4 out of 5 by Andy from Almost too rugged Very rugged case. The seal seems very tight. This willprotect your cards in pretty much every situation.The only problem is is that it is too extreme. I find myselfhurting my fingernails trying to open the latch. And then toget the CF card out sometimes can be really difficult. Youreally have to dig your fingernails under the card to pop itout. If you have to get your cards fast, you may have someproblems getting them out in time.Overall, I would probably get something else if I had thechance, as I don't really need the extreme protection thatthis case provides. Expertise: Semi-Pro Problems Encountered: See review above. Rated 5 out of 5 by Anonymous from completely worth it! Though we have only owned these (we have two) for about a month, they have been great! The window in the back allows you to view the card. Since we use them on location for events we labeled the back side 1/2/3/4 respectively, along with the gig size. This is super convenient when on the go. We can just shoot the cards in order and know exactly what size card we are reaching for! They are a great size and fit in every camera bag we own. Each team member has a different color case so no one gets confused with others cards. The cases are very well made and the cards, while a fairly tight fit the first few times, fit perfectly in to the slots, nothing too loose, nothing too tight. A great buy! Rated 1 out of 5 by fixedfire from Heavy, Hard, Tight I can't believe how hard it is to fit CF cards into place. This is a stupid, unforgiveable design error. The thing is supposed to hold CF cards!!! Did you not have a ruler to measure for the most important and basic function of this product?? Sheesh! It certainly seems water-tight though. Cuz that's what people really need to watch for every time they're shooting in the middle of the ocean. And it's pretty durable cuz yeah, I'm always rolling down hills with my camera gear. When you stop to think about it, when have you ever needed indestructable, bulky storage for your cards? Shoot. Pocket. Backup when home. Rated 2 out of 5 by Amanda from Too snug for my CF cards! While this is a well made product and I love the ability to have the windows and all of the colors it comes in, I found this product to be very disappointing for a couple of reasons. It's a bit difficult to open for a petite woman like myself! I have to give it a good tug, which I guess is good for durability, but bad for my fingers! Secondly, the CF cards fit in TIGHT. Way too tight. I literally have to PRY them out, and push to get them in. Not exactly ideal for the weddings I shoot, when sometimes the card change has to be quick. I've wound up using this to store the cards I expect to use last and when I find a moment, I switch in my used cards so that the unused ones are ready to fly from a more convenient case. Rated 3 out of 5 by Anonymous from Solid but bulky I have mixed feelings on this case. It will, without a doubt, keep your CF cards safe. In fact I think this container could survive a war. But quite frankly, I think its overkill. The container is almost 1 thick when closed. And for its size, you'd think it held 8 CF cards. If you want max protection for your cards, this baby will provide it. But I won't purchase another. I just wanted something to keep my cards stored in... this takes up too much space. Hi, are you using SD or CF cards? Trent is correct, they do fit, and they are meant to be a tight fit. Answered by: Kingsley J. B. Will cfast cards fit in this case? Answered by: FRANCIS E. C.
Yes, that's how I use it! What is the difference between this and the Gepe All-in-One Card Safe Extreme (Onyx)?